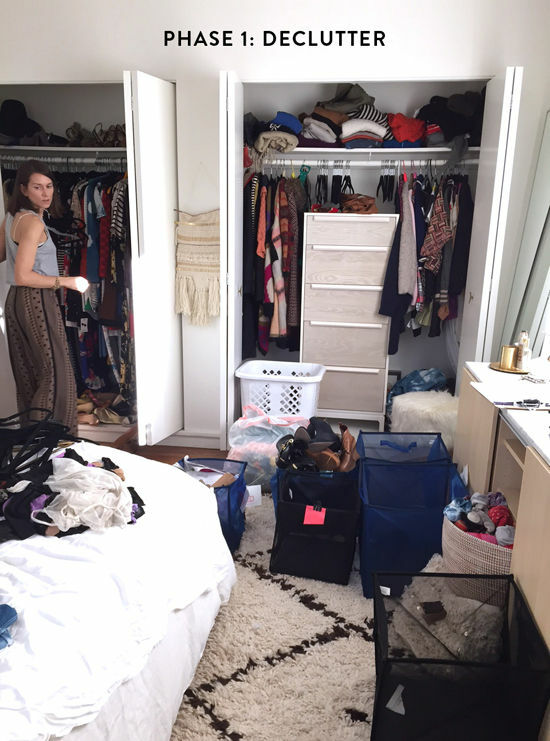 one of the first steps in my personal process was giving my closet a good clean out. there was a lot of stuff in there that i hadn’t worn in years but that was saving for one reason or another. de-cluttering freed up some space (and my mind!). we all have those outfits that we say to ourselves “i’ll fit into those skinny jeans again someday. or that dress will fit once i go back to the gym.” she reminded me that keeping a bunch of clothes that don’t fit you in your closet only makes you feel bad about yourself, not good. reward yourself once you drop a few pounds…don’t torture yourself! “I also noticed that Bri was using the tall dresser to store skirts. I knew that if we got rid of the dresser, we could gain some space and hang the skirts which would open the closet up and make her belongings more accessible. In order to maximize vertical space, we put to use a which works perfectly for hanging her cute skirts. Closet rod extenders instantly create another rod in the closet which allows you to store blouses, skirts and shorter length garments. This can be expanded width-wise and height-wise allowing you to customize your closet. Again, because it’s winter right now, the coats are super easy to get to and access. Once summer rolls around, these coats can get moved to a less-often used closet or stored more towards the sides of the closet (which would make room for summer layers). we also added a step stool to access the top shelve and two new basket ( and ). Instead of having a tall drawer unit which blocks harder to reach spots on the side of the closet, we opted for a to store other categories of clothes (shorts and undergarments). Next, we organized her dresses by color as well as her blouses (I often organize clothing going from dark to light) and if you want to be hyper organized, you can organize within the color coordination by type (i.e. ; All black dresses together going from long sleeve to short sleeve to sleeveless). you also might want to consider moving out any clothes that you don’t wear that often (we’ve already mentioned seasonal clothes but another category that might be relocated would be formal dresses and shoes). ta-da! it’s amazing what a difference a little organization and space utilization can make. thanks to for making my morning routine so much less stressful! i can’t believe this is really my closet now. i feel so adult. haha! The link for the shelf dividers doesn’t work. Where can I get them?? Perfectly timed post! I went to grab my favorite sweater from the mass of sweaters/leggings/tshirts on my closet shelf and was covered in an avalanche of clothes! I know what I’m doing this weekend! Thanks, Bri and Elizabeth! I recently organized my closet too, I feel SO good! Also, great tips Elizabeth. They will come super useful in the future. I love an organized closet! When my husband and I moved into our condo I bought clear plastic shoe boxes to organize all of my shoes. I also colour code my closet because rainbows are always a good idea. Such a great idea! I have been needed to do this same thing since we moved into our house 2 years ago. It’s amazing how long you will just ignore a closet and how much better you feel once it is finally well organized! Love this! My closet is in the “money” part of my house according to Feng Shui I think it’s about time I put some of your tips to use! I’ll definitely be utilizing these tips! I plan on re-doing my room and am in desperate need of closet organization guidelines! As a fellow professional organizer, I approve!! Such a beautiful result! Wow, this is AMAZING. That is a truly gift to be able to organize like that! The ‘after’ picture looks amazing! I love the shoe storage you’ve incorporated. Ahhh it is SO beautiful! I don’t have a ton of closet space and am trying to economize what space I do have. This is inspiring. 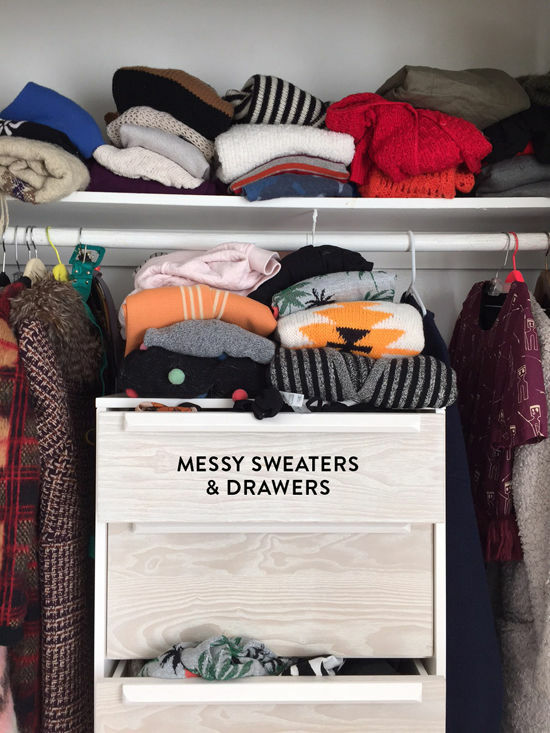 I’ve been trying to organize my closet, and these tips were exactly what I needed. I love the idea of using a hanging closet rod to maximize my space. Organizing my clothes according to color could also make getting dressed in the morning a whole lot easier. Thanks for sharing these tips! Looks amazing! Thanks for the amazing tips. Love it! Spent last week doing the same thing to my closet, new slim non-slip hangers and all! Looks great and your closet is HUGE!! I’m moving out soon, this was incredibly helpful! I need to do this and just keep putting it off. Looks great! that looks great! i definitely need something along those lines. my closet is the size of an infant…and such a disaster. Organizing makes me feel alive (dorky but so true!) and this post was amazing to see. I have ZERO CLOSETS in our apartment, so you can imagine that the struggle is real! Sidetone: if anyone else is looking for wire hampers like the West Elm one pictured in this post, Target actually has one for $25! I searched hi and low for one I liked that was under $50 and accidentally pumped into an awesome one at Target! That’s an improvement! You need some Elfa closet organization in there though!! We can help if you would like us to!? Your answer lifts the ineeillgtnce of the debate. 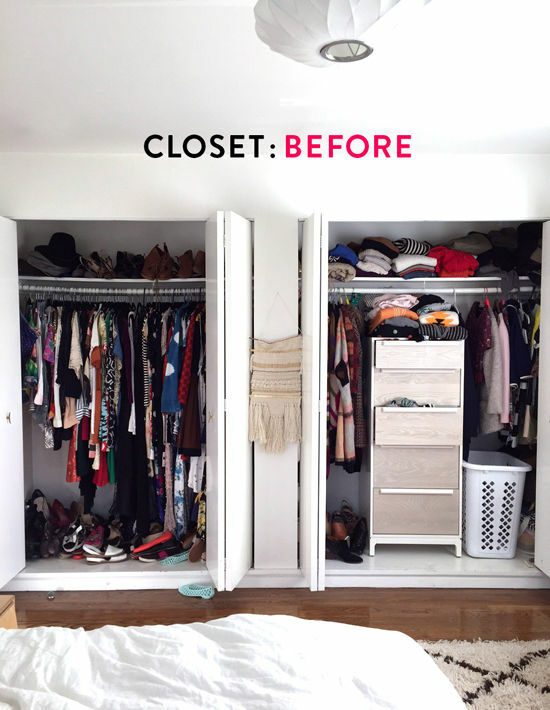 I love seeing closet before and afters haha, call me cray. I need some of those shelf divider things, but I have the wrong kind of shelving in my closet for them. I need to find dividers that work with my type of shelf! Looks SOOOOO good. I’m in the process of moving and look forward to messing with my wardrobe a bit and organizing all my shtuff. Your closet is like, totally artsy. Can you say where you got that great looking stool? hi alice! it’s from target! The before picture looks just like mine! Love. 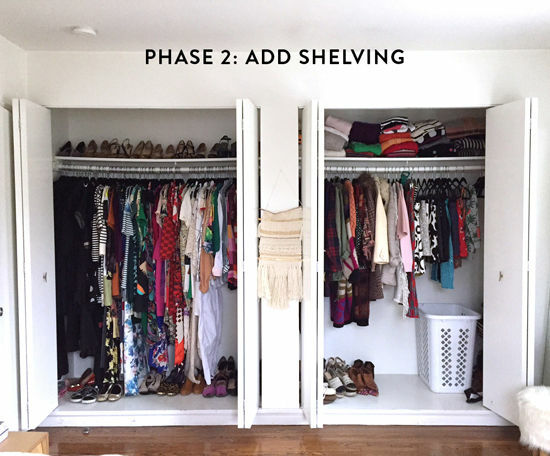 Thanks for the inspiration–hopefully I can make a change to my closet in 2015! 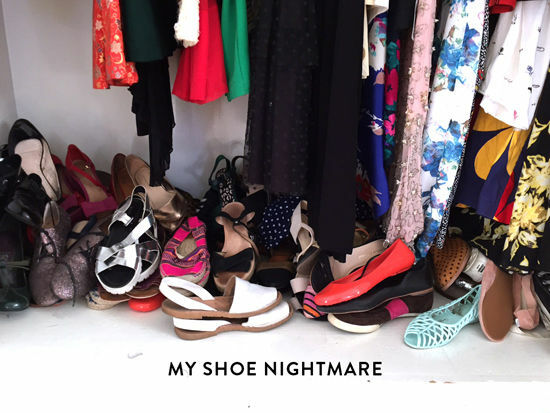 I would be afraid to pile my shoes like that – in the before pic. They could get a scratch from another shoe etc. Would love to know about the little step stool – its gorgeous! ok – I’m from LA, Bri where did you drop off the clothes you didn’t want anymore? #scavenger <– right here. That’s awesome. I am totally going to use some of these strategies in my own closet! Fabulous this dressing!!!!! I dream to have the same! You have such a lovely storage! Everything has its place! looks so great! i organized my closet this weekend, and it feels amazing!! Oh my God. Can I please adopt Elizabeth? I love love love that white and orange sweater with the Aztec design! 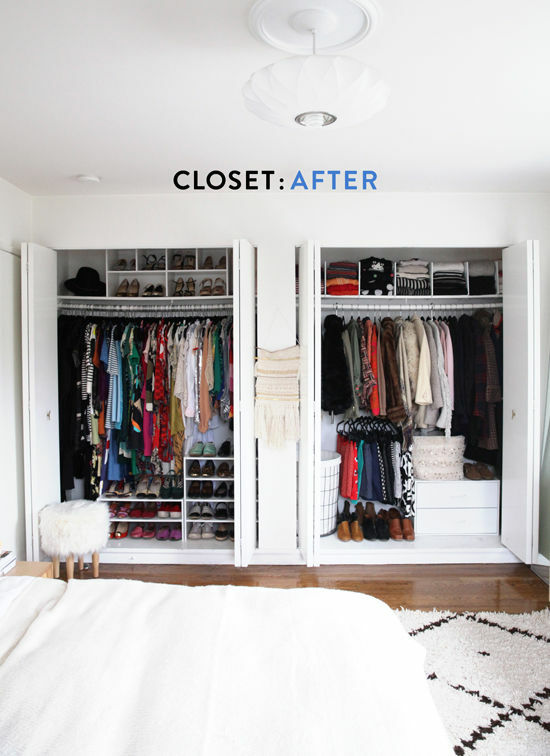 Woah the difference between the two closets is massive! 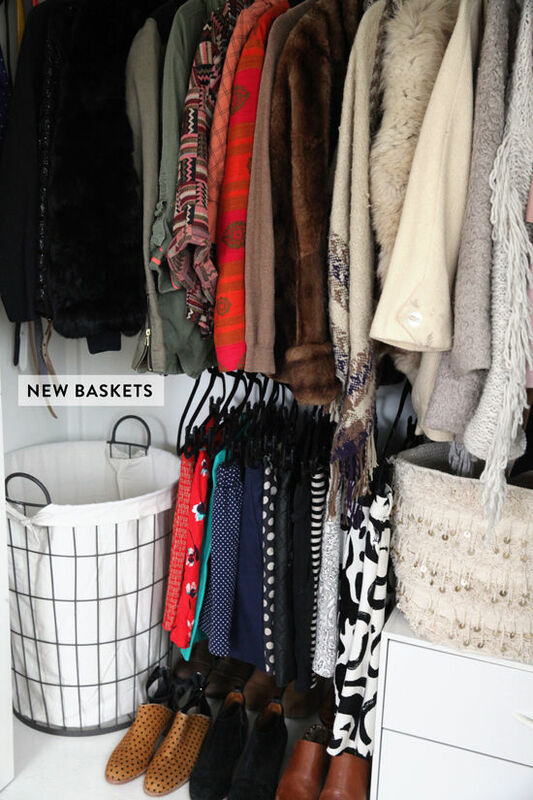 And now I have some inspiration on how to clean out my messy closet with no absolute structure! This is great. Love it! looks amazing… so much better!! This. Is. Amazing. I have a similar storage space to you so could totally pull off what you have done. Weekend project for sure! Nice makeover! 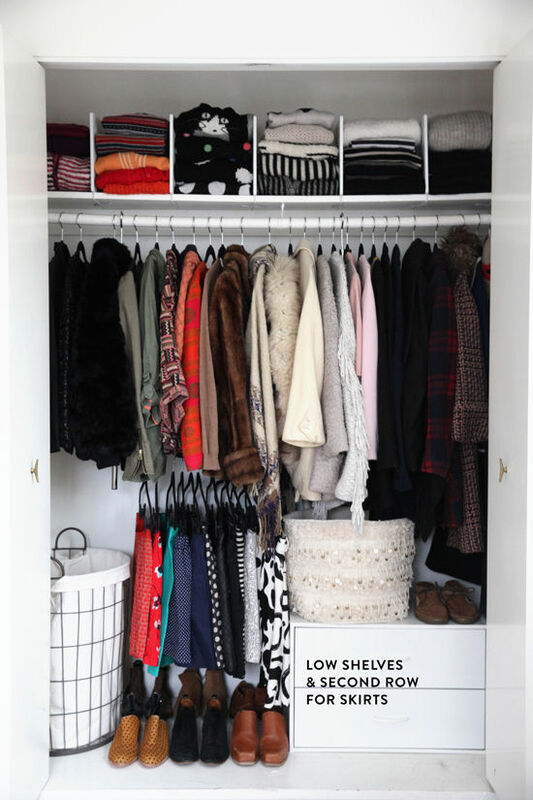 I need to do this with my closet! It is really messy and I don’t even now what I have there anymore! Thanks for the post! Greets, Storage Farringdon Ltd.
Looks great. You showed us how organization and space utilization can make a great difference. I have got a custom built closet for my bedroom in toronto ( ) as a part of home remodeling. Now I want to light up the closet space and I am spending a lot of time searching for the right one what I exactly need. Can anyone suggest me a better option with the method of perfect lightning? Thank you in advance.